New Galloway stands in an enviable position on the fringes of Galloway Forest Park and Loch Ken. As such it is a haven for all outdoor enthusiasts and nature lovers who can enjoy the breath-taking views across the water and endless woodland paths, as well as being a superb spot for golf, fishing and water sports. Birdwatchers flock to Loch Ken to take a trip down the Galloway Red Kite Trail to enjoy seeing the birds who were recently re-introduced into the area, and walkers can also survey the ruins of the once imposing Kenmure Castle. Originally constructed in the Middle Ages, the castle underwent several renovations after being ravaged by fire on more than one occasion and it had many uses throughout its history until it eventually fell into a state of permanent disrepair at the end of the 1950s, and local legend has it that it is now haunted by a headless pipe player. For those who prefer more alternative outdoor pursuits, New Galloway’s neighbouring village of Parton hosts the annual Scottish Alternative Games, which includes quirky contests such as tractor towing. Here at Hog Roast New Galloway, we love getting out in the open air and cooking in all of the picturesque locations the area has to offer. We also make the most of the fantastic local ingredients available in the region and source only the freshest vegetables and meat that has been reared in the most ethical conditions. 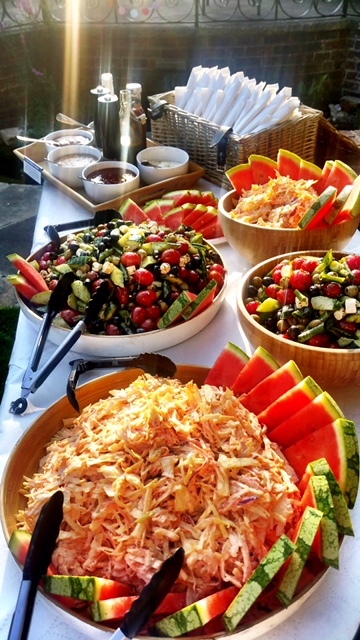 Because of the way we operate, no location is impossible for us cater in, which in turn allows our clients in New Galloway to have the best of both worlds-the food they love in the location of their dreams, and it gives us great pleasure to be able to provide this day after day. Whether we are catering by the side of Loch Ken for an elegant outdoor wedding reception, putting on a crowd-pleasing buffet for the spectators and hungry contestants at the Alternative Games, or rustling up a treat for members of local golf and angling clubs, Hog Roast New Galloway gets it right every time and will give you a dining experience that you will never forget. We are also a very environmentally-friendly catering company and are incredibly diligent when it comes to cleaning up after the event. The only trace of our presence we will leave behind us, will be the lingering aroma of our delicious slow roasted pork.